The existing material value in a worn or lightly damaged bearing can be salvaged by a comprehensive reconditioning process. Cost savings of 20% to 80% of a replacement bearing are typically provided. The first step in this process is a thorough cleaning and inspection to determine its condition. Raceways are polished or re-ground as required, new components such as rollers manufactured, and cage pockets enlarged. Specifically, all worn or damaged surfaces have been reground or replaced and the bearing completely restored. Final inspection completes the process as all components are 100% inspected to ensure every reconditioned bearing meets our highest quality standards to give the user many more hours of service life. A warranty is provided on all our reconditioned bearings regardless of the original manufacturer. American Roller Bearing Company provides repair and reconditioning services that can extend usable bearing life for increased value and performance. We service all types of bearings from any manufacturer. Fully reconditioned bearings receive the same warranty as new bearings. Services range in cost of 20% - 80% the cost of new providing significant savings opportunities in replacement costs, faster turnaround and providing the ability to re-use a special rather than replacing it. American can modify your existing bearings adjusting clearances, modifying spacers, adding counter-bores, etc. We provide complete regrinding and matching for cluster mill and support roll application. We provide all standard levels of reconditioning cleaning, polishing, re-grinding raceways, manufacturing new rolling elements, modifying or replacing cages and re-setting internal clearance and repackaging. We are ready to set up a customized program to meet your specific requirements. American’s reliability and expertise as a bearing manufacture assures the success of your program. Your bearings will be handled and processed in the same plant by the same operators, on the same machines, to the same tolerances, procedures and standards as new bearings. Our process and procedures are ISO certified, our materials are specified to ASTM specifications and our tolerances are to ABMA, ANSI and ISO industry standards. The result is remanufactured bearings that are truly as good as new. Just like our newly manufactured product, refurbished bearings are produced using the same equipment, same operators, same specifications, same tolerances, same processes, same procedures, and to the same warranty. Like new from a company that knows new! Beyond the product, process and warranty American Roller Bearing Company supports both new and reconditioned bearings with our Regional Sales Managers to address your needs and customize a program to fit your requirements. We also provide Industry Service Specialists to issue in-plant field services to assist you in evaluating and applying your bearings to get the most value from your investment. These services are available to you through our network of authorized distributors that are already an intricate part of your supply chain. How do you know whether to replace a bearing or repair it? 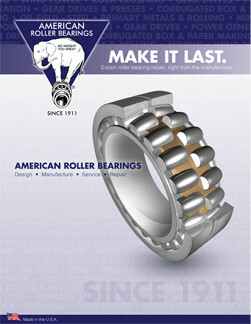 Ask your distributor to call in the American Roller Bearing experts. Our Industry Specialists are also available to provide training for your maintenance team on a variety of topics to help improve shop safety and extend the performance and service life of your bearings. Topics include; storage and handling, installation and maintenance, extending life though field repairs, recognizing and understanding failure modes and more. American Roller Bearing can modify existing bearings to meet changing needs, such as adjusting clearances, modifying spacers, adding counter-bores, and more. We also develop customized repair programs for roll shops, cluster mills and support rolls to meet their unique specifications and needs, including regrinding and matching services.